A Parliamentary report of 1777 recorded the existence of a workhouse in Bishop's Stortford with accommodation for up to 70 inmates. There were also establishments at Sawbridgeworth (50 inmates) and Albury (40). In the late 18th and early 19th century, a poor house is thought to have operated in rented premises at Hockerill. 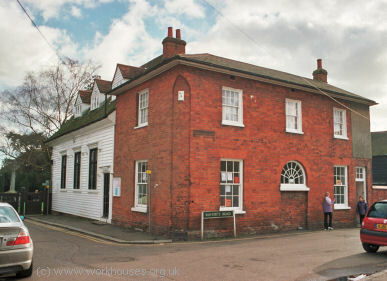 The Sawbridgeworth parish workhouse appears to have occupied a building now known as Church House adjoining Vantorts Road. Sawbridgeworth former parish workhouse, 2004. A house on Gall End (formerly Gallowend) Lane in Stansted Mountfitchet was previously known as the Old Workhouse and is said to have originally housed lepers. Stansted Mountfitchet Old Workhouse site, c.1880. 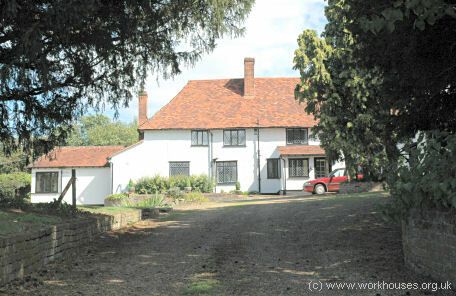 Stansted Mountfitchet former workhouse from the south-west, 2006. Hertfordshire: Albury, Bishop's Stortford (4), Braughin (2), Little Hadham, Much Hadham (2), Brent Pelham, Stocking Pelham, Furneux Pelham, Sawbridgeworth (2), Thorley. Essex: Berdon, Birchanger, Farbham, Elsenham, Great Hallingbury, Little Hallingbury, Henham, Manewden, Stansted Mountfitchet (2), Ugley. The population falling within the union at the 1831 census had been 18,012, with parishes ranging in size from Stocking Pelham (population 158) to Bishop's Stortford itself (3,958). The average annual poor-rate expenditure for the period 1831-34 had been £17,421 or 19s.4d. per head. The Board of Guardians held their first meetings in the George Hotel, North Street, and later at the Corn Exchange. A new Bishop's Stortford Union workhouse was erected in 1836-7 on a 4-acre site at Haymeads lane, Bishop's Stortford, to designs by TL Evans. It opened on 10 June 1837 with an initial cost of £9,137. An additional amount of £23.5s. was later approved for the building of a bell tower and bell for the purpose of summoning paupers to their meals. The workhouse location and layout can be seen on the 1897 map below. Bishop's Stortford workhouse site, 1897. The design was based on the popular hexagonal or "Y-plan" layout with a three-storey entrance block flanked by single-storey blocks containing porter's lodge, Guardians' board-room, waiting rooms etc. Bishop's Stortford entrance block from the east, 2004. 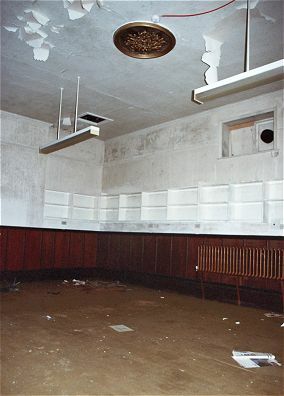 Bishop's Stortford board-room interior, 2004. Bishop's Stortford entrance block internal yard, 2004. To the rear, three accommodation blocks radiated from the central supervisory hub, surrounded by a variety of out-buildings. Bishop's Stortford from the north, 2004. A block of vagrants' cells was located at the end of the south wing. Bishop's Stortford vagrants' block, 2004. The first Master of the new workhouse was a Mr Anthony, the same man who had held the town's first Methodist meeting under a tree in the Causeway in 1823. The new building was at least partly furnished from the former Hockerill premises whose contents purchased by the Guardians for £185. 2s. Professional staff were few: a nurse also acted as a midwife and paupers did the ancillary work guided by a resident porter. There was a ward for the insane and a padded room for the violent, while those with serious infections were housed in a small cottage. A wooden hut, also used as an isolation unit, was often so crowded that food had to be kept in the bathroom. Sanitary conditions left much to be desired: an open trough pumped raw sewage only a short distance from the building. This was finally resolved in the 1870s when a sewage farm was opened on 42 acres of land at nearby Beldams Lane. In the same decade, there were several outbreaks of smallpox in the area and an isolation hospital was rapidly built in nearby Hallingbury Road. 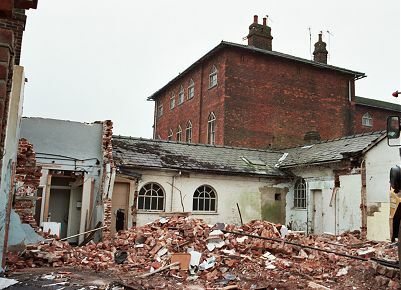 Labourers did the work on overtime at a total cost of £480, but the building, a wooden structure built on piles, quickly fell into disrepair and another was erected in Haymeads Lane, opposite the main hospital entrance. In the latter part of the 19th century, alterations and additional wards were erected for the accommodation of vagrants. In 1892, the Guardians purchased a further 13 acres of land at Haymeads to provide occupation for the inmates — growing produce for their own consumption. In 1894, the British Medical Journal set up a "commission" to investigate conditions in provincial workhouses and their infirmaries. Following a visit to Bishop's Stortford, the commission's report had much to praise about the establishment and its medical provision. One ward was described as "cheerful, airy, and well ventilated", and inmates were given bedding of flock, feathers and straw, according to their particular condition, with water and air mattresses also available. There were, however, several matters that required improvement: the number of staff was too small, with some responsible tasks being performed by paupers; a proper night nurse was required in the infirmary; the isolation hospital (a series of huts) was too small, with the bathrooms being used to store food; an open sewage trough also needed to be diverted from running past the block. Further details are available in the full report. It is said that gas victims of the First World War were brought to the workhouse under cover of darkness, and then rehabilitated in the infirmary wards. This secrecy was to prevent wide scale knowledge of the use of gas in the trenches of France. By 1926, the Guardians occupied purpose built mock-Tudor style premises at No 2 Hockerill Street, where they continued to administer until 1930 when the workhouse, now known as Haymeads, became a Public Assistance Institution under the control of Herts County Council. The separate isolation hospital was sold off in 1936, the same year as the famous Jarrow Crusade when unemployed shipyard workers marched 274 miles to London to petition Parliament. Their twenty five day journey south attracted much public sympathy, and on arrival in Bishop's Stortford they were warmly welcomed. Hot drinks and food were supplied and many were offered beds for the night in the former workhouse. The former workhouse later became the Herts. and Essex Hospital. 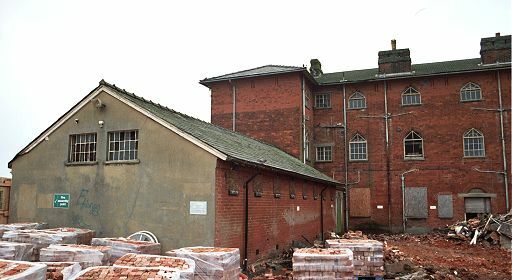 In 2004 the site was redeveloped for residential use with much of the former workhouse building being preserved. As part of the demolition work, some interesting workhouse features were revealed such as the innards of the old boiler. 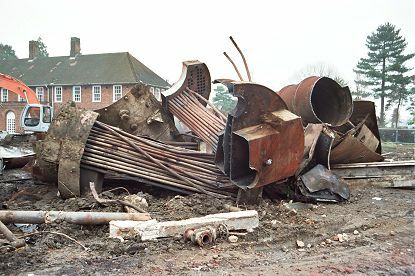 Bishop's Stortford workhouse boiler, 2004. In around 1912, The Bishop's Stortford Union opened a children's cottage home at 'Haroldene', Recreation Ground, Stansted Mountfitchet. It could house up to 16 children. Hertfordshire Archives and Local Studies, County Hall, Pegs Lane, Hertford SG13 8DE. Holdings include: Guardians' minutes (1835-1930); Cottage Homes records (1912-48); etc. Cooper, Jacqueline (2005) Bishop's Stortford: a history (Phillimore). The Diary of William Barlow, workhouse master of Bishop's Stortford (1848-1850) (great-great-great grandfather of Kerrie Blyth who has transcribed the diary). Thanks to Paul Ailey for kindly contributing material on the history of this establishment.